apologies to all if I have missed this being posted before by Russell. 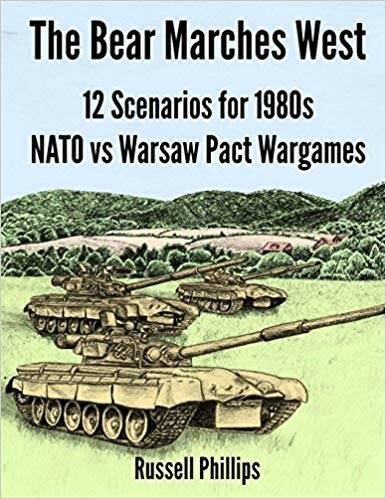 Not sure on this one, not enough detail to tempt me, while 12 scenarios is fine the fact that some will be too big for my sort of game makes it a poor buy. I would have liked a decent free one to see if the guy has what it takes and is not just a die rolling freak. Plus, Journal 78 includes two of the scenarios: Race for the Leine and Zirinski's Crossroads. Lost me on the first Page, the map. Really little thought has gone into this booklet. 1) No scale to the map. Pointless without it. 2) No definition of road width or whether they have hedges walls and or ditches all of which are critical and would effect the balance of the scenario. 2) No definition of strength of houses, wood brick, stone, cellars or not not. 3) Providing contours is a bit pointless we all know we can't achieve real heights. Would have been better to have put crest lines in so we could get the similar views from a lower hill system. Otherwise all the work is left to the buyer. All in all not a useful book. You can't scale that for diferent figure scales. At 1/144 I would guess that the map may still be bigger than a 8 by 6 at 1mm=1m. If you are using ITV you would hope they would be beyond 2000m from the action. So the map may be several km across, that woulkd be useless to me. At best its a vauge hint at a scanario but basically not worth the effefort as non of the detailed planning and definition has been done. May as well write your own. Shame really as a few ready to use scenarios would be usefull. I would rather have paid $2.99 foir one thought out scenario than 12 none starter ones. May as well write your own. Well stop your f**king whinging and do it!!! You're another one who comes onto this forum and just f**king whinges!!! Moan!! Moan!! Moan!! ...is that all you can do?? P.S. I will offer no apology for my comments, so if I get banned from this forum, so be it!! I feel that you lack some self control. I made the comments as I would not like folk to think that they were buying a usable set of scenarios. I have in the past bought skirmish games scenarios and they have been much more complete and usable without effort. Your loss of self control is disappointing. Constructive criticism should not a cause of such a display. Constructive criticism should not a cause of such a display. Personally, I have great self control, and personally, I don't think you've offered any 'constructive criticism'...you've just offered criticism. So, as I have previously stated, if you can do any better, do it! !